Today was a bit of a different day at School, we had a full day of life drawing. We were given a number of different media to use including ink (which we broke down to three strengths dark mid and light) and a mixture of utensils. We were told to let go of the ego and allow ourselves to be open to creativity. We were encouraged to use both hands to draw, and change media regularly. Music was played and we moved to the music and gave suggestions of positions which the model could take up. We worked quickly sometimes just using one movement on the paper to capture the essence of a position. We moved around the room drawing on others work as the model continuously moved, this was a very freeing exercise. I found a lot of freedom in the speed we were working, as it meant we couldn’t really think very much about the art, not worrying about getting it right is good. Our tutor who had been taught by Cecil Collins made quite a strong emphasis on the masculine and feminine; from movements we made to the utensils and media which we used. I feel this emphasis sort of jarred with the creativity (really I think it is to do with phrasing). Masculine and Feminine in the terms they were used here was very old fashioned, and didn’t sit well with the group. I would like to think that actually what we were looking at was soft/wavy and straight/strong movements and playing with scale of intensity of how we drew, which I feel in terms of what was being asked of us fitted better. Day 26: Marionettes; finding the hold. 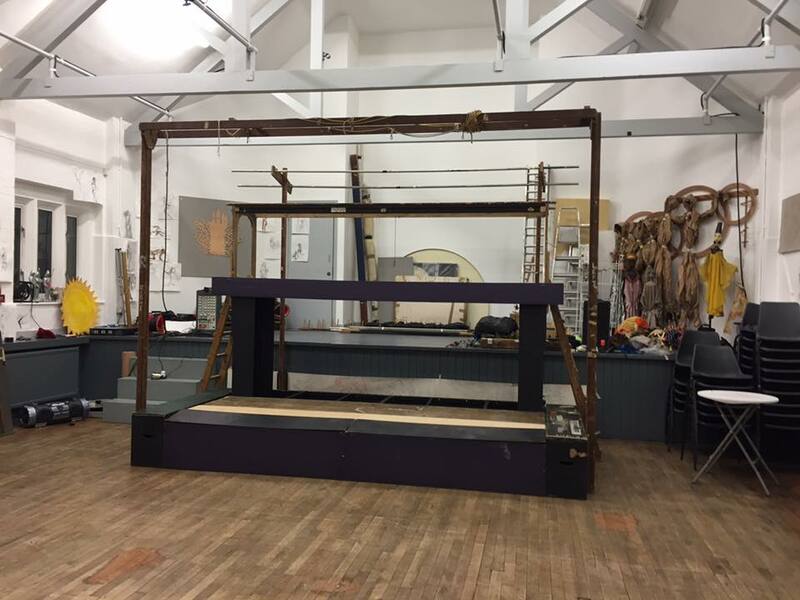 We begin three days of Marionette training with Ronnie Le Drew. First we had a bit of a demonstration from Ronnie and his own Marionette; it’s amazing the kinds of movement and real emotion that can be read from a marionette when used well. First we play with the marionettes, finding how to hold them; it’s a very different experience from other puppets I have used. We are shown the strings and each role they have in moving the puppet. We switch puppets regularly to experience the different weights; the puppets we are using are all from the Little Angel Theatre, a lot of them made/ designed by John Wright; some are from touring shows from before the Little Angel was opened; they are beautiful. We spend time walking with the puppets, it’s important for the puppets to be grounded, and the sound of their feet tapping on the ground is very satisfying; but it can be difficult especially when some of them have felt on their soles, I found the lighter puppets a little harder to use; it was difficult to judge if they were actually touching the ground to begin with. After class a group of us helped to put up the touring long string stage; this stage is so well designed, every segment has a function (storage boxes become the components of the stage), a very useful lesson in thinking about functionality and purpose when designing a puppet stage to take on tour no matter what kind of puppet show it is. Day 27: Precision of movement. Today focused on movement; particularly in relation to using the head of the puppet, finding the look and simple clear movements to really show the character of the puppet. We began by going over the movements we had learnt the day before; walking, bending, kneeling; emphasising the effort of the moves using down up impulses, and adding subtle head tilts. We spent some time in pairs using a nursery rhyme as stimulus to create a scene with two puppets, and were encouraged to use the rhythm of the rhyme. We chose a small bishop puppet and a larger heavier Monk puppet, our Nursery Rhyme was “Here we go round the Mulberry Bush”. We first played with using the rhyme traditionally and having both of the characters moving to the beat of the rhyme, but quickly we found that having the characters playing to opposing rhythms worked better, so our large monk moved in sweeping slow large movements and our Bishop moved in quick jittery moves. This helped to show a difference and establish their characters. We used the premise of the characters searching for the Elixir of life. Both characters searched for it but the Bishop knew where it was and would use it once the Monk had gone. While we worked it became really clear that when using marionettes having an outside eye is really important; it is of course for other types of puppetry, but I feel because of the distance between you and the puppet it is sometimes difficult to know exactly what the puppet is doing. We also got to play on the bridge with the long string marionettes which again emphasised for me the real importance of outside eyes. Day 28: Playing the Music of the Marionette. Today really focused on using rhythms and music with the Marionette; we had a Puppet Disco and explored all the ways the puppet could move interacting with other puppets as and when we liked. Having the freedom just to play with the puppets is really enjoyable. In the afternoon we used excerpts from different texts to create scenes using narration. We paired off so each of us had a chance to manipulate and narrate the piece and work together to familiarise ourselves with the puppets routine; it was great to work very specifically with a text. The text we had was from “the Iron Man” it was quite abstract when taken out of context. We looked at the specifics of movement which we could create using the marionette, and it was very useful to bounce off my partner helping to find specific moves using the strings. I really believe that using a marionette is very much like playing a musical instrument, delicate and specific movements really help it to play well. Like an instrument the more practice, the better you get; and as we become more familiar with the marionettes they become easier to play. 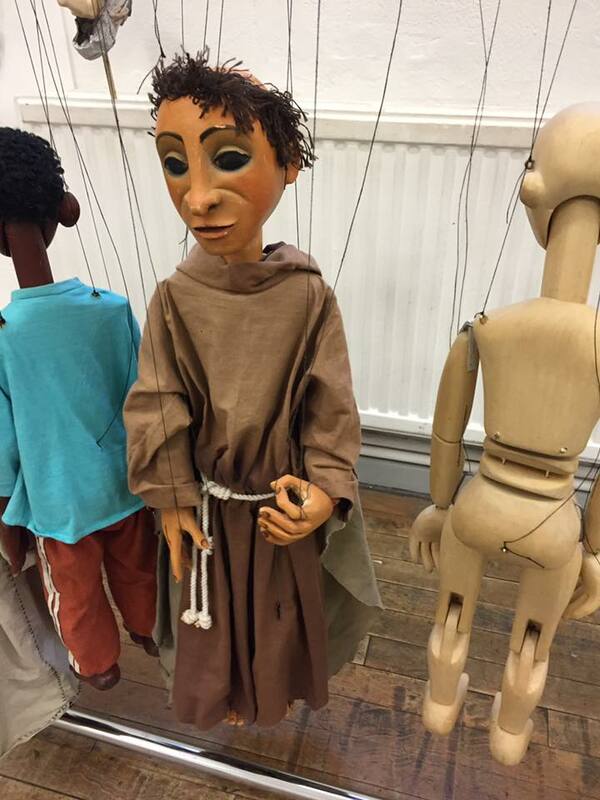 We have been really encouraged to play with the marionettes in any free moment; Ronnie told us that during his time as a teenager working at the Little Angel Theatre that is how he became familiar with the puppets, and he still plays with them whenever he gets a moment. Pretty inspiring stuff. We started this morning with a vocal workshop which culminated in us singing “Mary Mac” quite an infectious wee tune which I’m sure will be hummed around the workspace until the end of the course. Then using the text and the choreography from the scenes we had created yesterday we transferred this in our pairs to using Table top puppets trying to recreate exactly the same moves; this time with both of us manipulating the puppet together. It was amazing the difference working with a marionette hand on the way we approached the work. We were much more particular about the movements and it made us much more aware of the precision. Once we had spent some time developing the work, we paired up with other groups helping them in any way they wanted; from being a narrator of the puppet or being an extra hand to manipulate the puppet or just being an outside eye for moments we wanted to make sure were clear. It was great as a bouncing board to ensure what we wanted to come across through the puppets really was working. Today we spent the day constructing bodies to go with our carved hands and noses, using a combination of wood and foam. 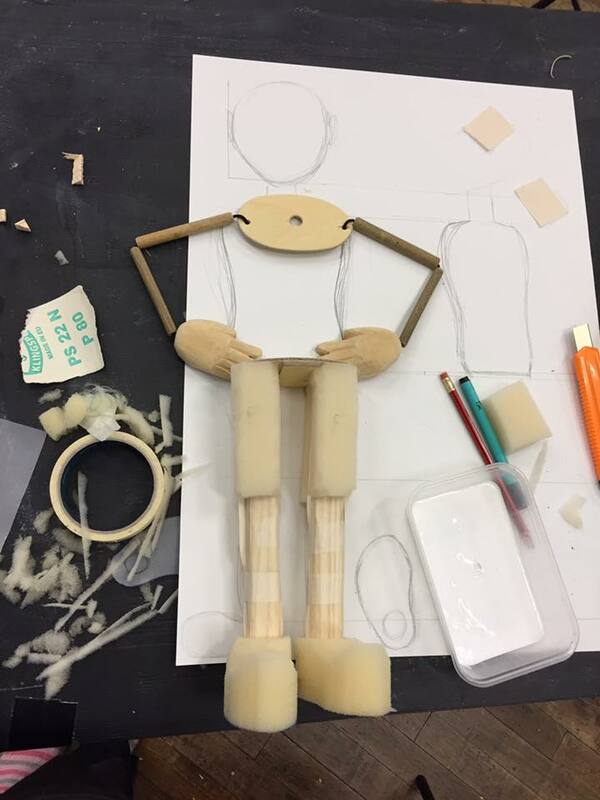 It was very satisfying seeing the shape of the puppet come together, first we took our drawings of our heads and noses and extended them into full bodies, we were given hip and shoulder plates and measured out the legs from hip to knee and knee to hip, we then got pieces of ribbon to create a hip joint and added thin pieces of wood to create the core of the thigh and then added larger pieces from the knee down to help create the weight of the puppet. 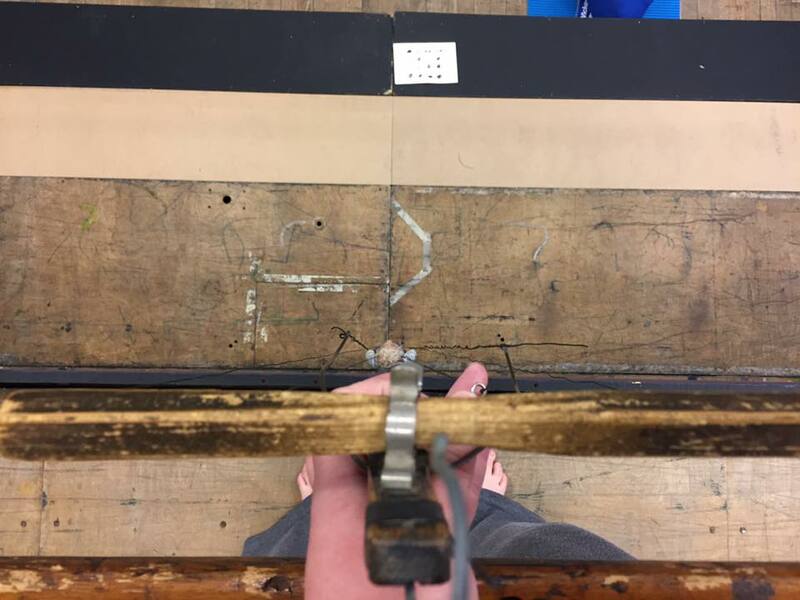 We carved feet from foam and attached them to the legs. From the shoulder plate we tied string and strung pieces of bamboo to create the upper and lower arm and then attached the wooden hands. So the skeleton of my puppet is taking shape, now I need to build it torso and do some more shaping to its legs and feet. We still have some more construction days to go, and I’m looking forward to see how all the puppets end up.